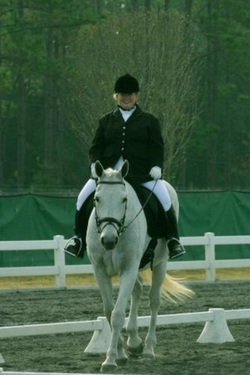 Dear friend and fellow horsewoman, lost her battle with cancer on February 11, 2012. She will be greatly missed. 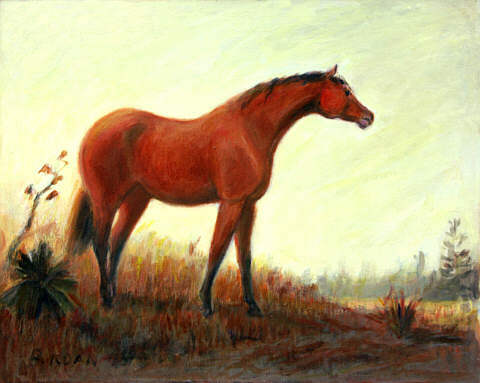 Her art blesses many equestrian homes. Sue was born in Philadelphia and studied with Beatrice Fenton, sculptor and Anna Ackenbach, painter. She lived in Venezuela for 12 1/2 years and in Peru for 2 1/2 years. Sue studied painting with Jean Troemel in St. Augustine, with Liz Maness in Texas, and with Taos artist Ray Vanilli. 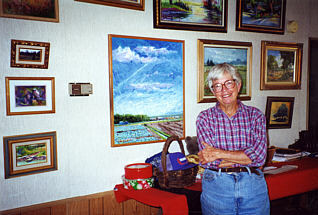 She was a member of the St. Augustine Art Association and a winner of several awards including two “Best of Show” awards. Landscapes and animals were her favorite subjects. Acrylic, oils and pen & ink with water color are her mediums. Remember Jasmine was lost to colic February 10, 2012. She and her owner, Tracy David, were a wonderful team and provided fun and fierce competition in the Dressage arena. She will be greatly missed by all, and most dearly by Tracy and her family. 2010 Year End Introductory Champion.